Movement that nature meant, is the underlying theme of Ruthy Alon’s somatic body of work. Alon, one of Moshe Feldenkrais’ original students has spent her professional life exploring movement in all of its implications on human health and well-being. Well known in the Feldenkrais community as a spectacular senior trainer of 40+ years, she has studied a variety of approaches as well as engaged in her own personal study of animal, evolutionary and human movement. 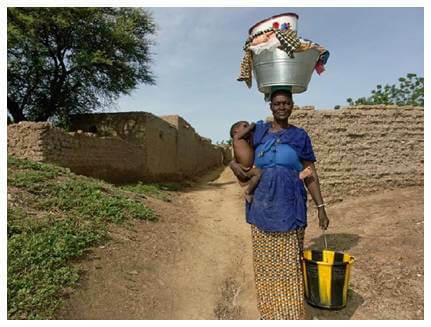 A major inspiration for branching off from the Feldenkrais Method and creating her own body of work was the African water carriers. These women with their incredible strength and grace in gait under pressure really called her to answer the question, “How has the demand of carrying loads that are 20-50% of their body weight on their heads across long distances informed their posture, skeleton and gait?” Using this question and detailed observation, she created the Bones for Life work in the early 1990s. Now there are five separate but interwoven programs under the umbrella of Movement Intelligence. Each of these programs stand alone, but can also fill in a unique aspect of your movement intelligence. The complete Bones for Life® program consists of 90 fast-acting and easy-to-learn exercise processes. The safe, weight-bearing movements challenge bones to be strong and sturdy while improving balance and coordination. Personal ergonomics. Using yourself differently instead of just changing the environment. Anti-osteoporosis/osteoarthritis. To a large degree both of these dis-ease processes are driven by ineffective movement and postural habits. Bone and joint health begins with quality, dynamic movement stimulation. Upright posture is developed through simple tools that facilitate controlled resistance to pressure, like using a strip of cloth as a harness, pushing a wall, or lifting weights in a new way. For the therapist/teacher, Bones for Life® provides a doorway for empowering students and patients for their own health and recovery. It benefits conditions such as osteoporosis, neck or back pain, joint challenges, compromised balance, and lethargy. The program also trains therapists in their own self-use and movement patterns, enabling health care professionals to engage dynamically in their profession longer and with greater ease. Read about our own Bones for Life research. 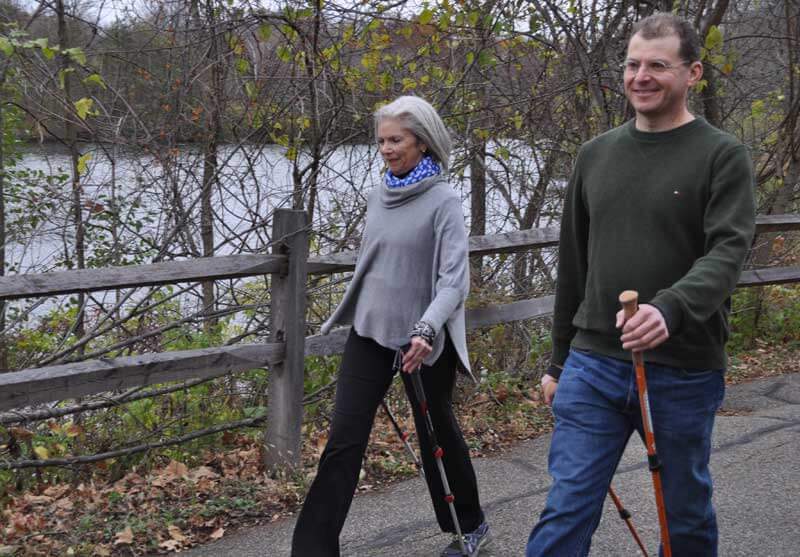 We have passion for walking at Integrative Learning Center and this Movement Intelligence program is a lovely addition to anyone’s walking practice. It also offers tremendous benefits in the rehab setting. The use of poles allows us to reengage with our evolutionary quadraped nature. The poles, as an extension of our arms, allow us to bear weight through the arms and use our upper back in walking as originally designed. Animals rarely have a stiff thoracic, but not so for humans. Yet if we learn to walk with poles and transmit the ground reaction force into the upper back we will gain skill, flexibility and strength that will transfer into walking without trekking poles. Walk for Life contains both a robust indoor somatic program as well as a lively outdoor component. Research by the University of New Hampshire’s Department of Kinesiology has shown improvements in balance and gait. Read more about this research. We have heard that sitting is the new smoking. That you cannot actually make up for all those hours of sitting by simply exercising for an hour at the end of the day. The Chairs program capitalizes on the western world’s obsession with the chair so that instead of the chair as a tool for disease, we can convert the chair to a mobility tool. These short exercises rewrite our maladaptive use of chairs into dynamic sitting. This program is largely a reinterpretation of the Bones for Life work in the context of sitting. It can be useful for working with people who cannot immediately get down on the ground, or in environments where floor space is not available. But beyond that, we have found even the healthy individual can learn important aspects about their organization in the Chairs program in a way that is truly unique. Break the new smoking habit—get dynamic in sitting. All movement, whether it is the movement of emotion or the physical tends to come from a habitual state. Our relationship to food and the way in which we approach food and chew it is also likely habit. Habits can serve us well and they can also be a burden. In Mindful Eating, learn strategies to reconnect to a deep inner knowing about what to eat, what supports life and when not to eat. Lower the noise and demand of modern life so you can hear and interpret the inner signals that can allow you to become aware of addictive habits and regain control over your life around eating. The path in Mindful Eating is not of rigidity or self-denial, but instead one of listening to the small voices within that are often overlooked.The equation for healthy eating is simple. Or using any combination of these three. The gentle, nonjudgmental somatic exercises explore non-habitual options for eating and movement, allowing us to break free from stuck, counterproductive ways. Learn to trust yourself again. Learn to how to truly nourish your body. Self-Care Strategies to restore ease & pain-free functioning at any age. Awaken your body’s autonomous, sensory-based compass to better calibrate and coordinate integrated, ergonomic, and efficiently streamlined movement through Solutions for Optimal Mobility. Life happens and in so doing sometimes our inner compass becomes confused or damaged. But this compass can be recalibrated and brought back to optimal function. Not through knowing a “right” way where one habit is exchanged for another, but by knowing how to give yourself quality brain and body food. This program offers laser focused somatic processes designed to be used in private sessions and taken home for self-use. Find problem free, pain free movement. Sample themes of this program include: feet, arms, shoulders, back, hip joints, neck, and scoliosis. Ruthy Alon was one of Dr. Moshe Feldenkrais’ first students. (Dr. Feldenkrais was a pioneer in somatic education.) Alon is an accomplished senior trainer in the Feldenkrais Method® and has trained thousands of practitioners around the world. Alon is the author of Mindful Spontaneity and producer of the video, Movement Nature Meant. Alon became inspired many years ago by the women of West Africa who carry heavy loads on their heads. Studies of their efficient gait (walk), low bone density, and low hip fracture rate caught her attention. Drawing on her vast understanding of human movement patterns and analyzing the West African load bearing gait, she shaped a program addressing the issues of healthy bones, uprightness and strength. Now in her 80s, Alon keeps a busy international schedule. Here she is seen jumping in the harness. For this jump, the harness is used to wrap the joints, giving security to the hip joints and the spine in particular. Professionally: As an acupuncturist and craniosacral therapist I have learned to feel restrictions in my clients lying on the table....during the class, I learned to see those restrictions and how they affect movement and gait...I gained an appreciation of how structural balancing and aligning leads to greater vitality and self-expression...balancing the qi, revitalizing the life force energy, opening the midline to the breath of life. Gait for Wild Human Potential was a good challenge for me, moving from typical student to more physical learning to interacting with other people and still being responsible for my own learning. The modeling of the instructors in calling forth the compassionate reflex was very key to my own growth and comfort. I’m even more impressed two months after the gait workshop. The perceived benefits mentally, physically, emotionally and spiritually continue to operate in my daily life. Especially helpful was the model of a "dive" downwards in preparation for a jump upwards and outwards, i.e. to a higher place. And in fact I did take a very uncomfortable dive into a dark and scary place and have jumped to a more integrated actualized version of myself. I felt and still feel totally supported by the teachers and the group in my own process. It’s remarkable to feel so safe and intimate with others without feeling crowded. Even thought the physical space was small, the experienced space was very roomy. Wow, so, so much put together to create this workshop. I loved the somatics. I can use this material in my place of work, Long Term Care. I so enjoyed the taking one function--gait--and covering the parts so thoroughly that I actually get it! I feel smart, for once in a Feldenkrais-ish workshop. I will be able to USE this material!!! Thank you for being so technical without resorting to language that loses me. For keeping it somatic, yet giving my mind so much to run with. For teaching so well, both of you, with such neutral expressions of personality. I am so grateful for your work, and your willingness to travel here to teach. This workshop will have a tremendous impact on my movement health, and on how efficiently I can help my Bowen clients stand & walk more fully into their lives. Extraordinarily, powerful experience. I reclaimed a relationship with my mid ribs. I feel stacked from the bottom of my stance leg, supported and ready to lift my swing leg to transfer again. I appreciate so much that you have taken the skills from Bones for Life and Feldenkrais, and just who both of you are, and applied them such a basic function which I agree is essential in our human development at all ages. I feel like I can now apply this to all ages of people who come for a number of different situations. Carol and Cynthia do a super job of developing a clear and logical approach to the Gait program and theories with an easy to follow presentation. I appreciated that I saw so many others in the class with gait issues. I have felt alone in coping/relearning my optimal gait. The encouragement and support I received from fellow workshop participants was just wonderful. I left the workshop feeling confident in my gait and no longer feeling like a patient. The Advanced Training “Gait for Wild Human Potential” will illuminate your thinking and enliven your teaching about this basic human function. Cynthia Allen and Carol Montgomery are gifted teachers, weaving together information about the role of reflexes on lifelong movement patterns and detailed anatomical analysis with individual and small group movement practices to clearly explain and allow participants to experience the concepts of Integral Human Gait Theory. I especially appreciated the discussions of approaches and techniques to address specific movement challenges. Carol and Cynthia generously answer questions, provide individual attention and suggest approaches for back-home application. I highly recommend this advanced training for both experienced Feldenkrais® or Movement Intelligence® practitioners and for those just starting out. Together, Carol and Cynthia are infinity and beyond; Buzz Lightyears and beyond; This workshop is the Hitchhikers Guide to Gait.